I’ve been working on a post for a few weeks and was all ready to publish it when I realized the photos are all sitting on my flash drive back at the office. My backup plan was to have my new frame in a post, but FedEx screwed that up. Sigh. We’ll have to wait until next week for the MAX/MXL post. Until then, enjoy this Eddy Merckx Jersey that Sasha recently purchased. Bud Light. Seriously? Amazing. 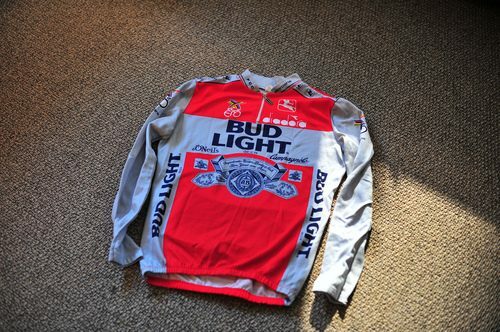 Bud Light sponsored races back in the early 90’s and Eddy Merckx sponsored a team. What a find. Now if it were a Budweiser Eddy Merckx jersey, I’d have to “borrow” it from Sasha. Anyway, to satisfy the vintage Eddy Merckx cravings, there’s a Mavic-equipped Professional below. This Professional was repainted by Colour Tech in the UK with decals from Cyclomondo on eBay. That Mavic group is in great condition. Really dialed build.